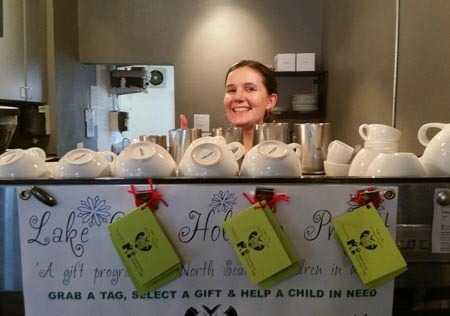 Lucy (pictured here), the manager at Cafe Javasti in Wedgwood (javasti.com), welcomes the Lake City Holiday Project enthusiastically, every year. She and co-owner, Scott Morrell, make room for the rave green holiday tags that wait for the kind people who patronize this neighborhood jewel. With the smells of coffee, fresh bake goods and crepes coming out of this 8617 35th street NE business, its comforting to know the commitment CAFE JAVASTI has made to the community. Staff are friendly and welcoming which goes along way in creating an atmosphere that allows for a slower pace and time to get to know your neighbor. Thank you Cafe Javasti! Check out their sister store in the Maple Leaf neighborhood at 8410 5th Ave NE as well. They too create a warm and welcoming atmosphere for bean lovers.